Fulbright Alexander MacDonald, his friend Nora Rodriguez, Fulbright Amanda Bernhard, and her husband Jonathan Kennedy at Hughes Pub last night. 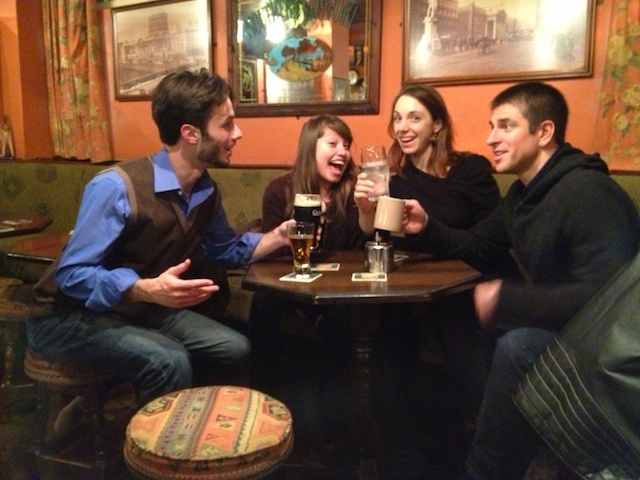 Several of this year’s Fulbright Students to Ireland were invited to Dublin to be interviewed for a Fulbright video. They shared advice for others who want yo apply for student programs to Ireland. Fulbright was reimbursing their travel expenses but we were able to save them some money on housing; Amanda and her husband Jonathan stayed with me instead of a hotel. After the interviews, two of the students, their significant others, and I went out to chat about our Fulbright experiences. Hughes pub has the added benefit of being a late night venue. Last call is 2 AM at least on weekends, I do believe, while many other pubs stop serving hours earlier. Hughes pub was perfect for the talking we wanted to do — the regular Friday night musicians were playing in the snug. Last night we sat outside the snug but we could still hear the music in the background. The level was very comfortable for talking and laughing. And that we did! So what’s a snug? It’s an enclosed room, where in the distant past women were allowed to gather and drink. Back then, they weren’t allowed to be in the main (men’s) part of the pub. You’ve seen pictured of the snug before (It’s where brothers Gavin and Aidan Duffy play on Monday nights — I’ve attached a photo here in case you didn’t see that post). 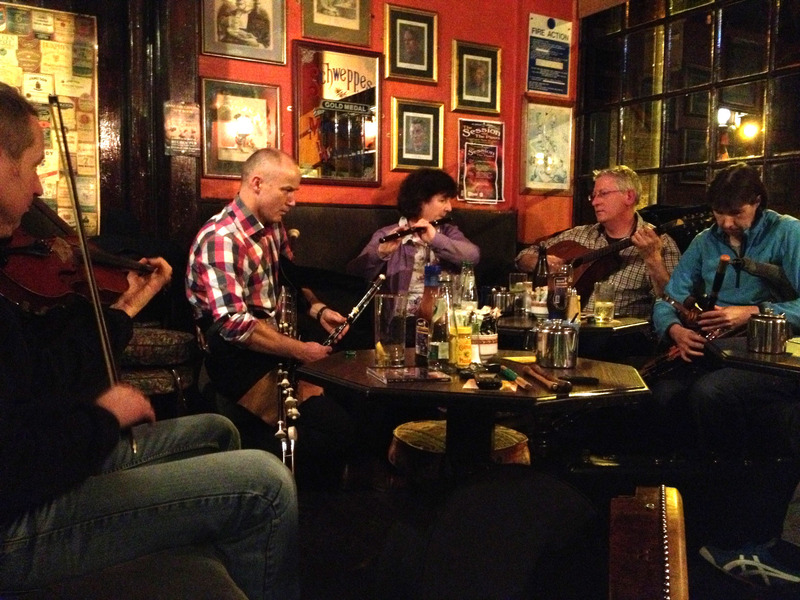 The Duffy brothers (to the left) playing in the snug at Hughes Pub last fall. I learned all this from Saul Golden who teaches at the University of Ulster and whom I met at the All Ireland Architecture Research (AIARG) last weekend. You didn’t get to her Saul’s description, so I searched on line for a defnintion. A very small private room in a pub. Alexander MacDonald is a highly accomplished tap dancer who hails from New York City. He is currently working on a Master’s degree at the University of Limerick. He is studying enthochoreology (which is the history of choreography in various cultures). He’s got two tapping videos on line, one improv and one from a party. His friend Nora Rodriguez is from Mexico. She is working on a Master’s degree in contemporary dance performance. It was the first time Amanda, Jonathan, and I got to meet Nora, and we enjoyed out time with her immensely. If you’ve followed this blog, you already know that Amanda Bernhard is a Fulbright who is working on a Master’s degree in Irish at the University of Galway. Her husband Jonathan is enrolled int the same degree program. They are very excited about the dialectology (theory and study of dialects) course they are taking this semester. Immersion experiences like the one we’re in prompt reflection. We’ve all be soul-searching. Our evening at Hughes’ gave us an opportunity to share our thoughts and experiences — and to consider them in new ways. I wanted to get in the photo, too, so we all had to be very still while I took a panorama. In this photo Shannon Chance, Alexander MacDonald, Nora Rodriguez, Amanda Bernhard, and Jonathan Kennedy contemplate the photographic procedure. Nora was fascinated by the story Amanda, Jonathan, and I told of the car fire we’d just witnessed beside my apartment building. She was captivated by the story but, just having seen Quentin Terintino’s newest flick, though the photo didn’t live up to the image our story had painted in her head. Nevertheless, I assure you the events were dramatic. Jonathan had insisted on taking a closer look, and as a result, we witnessed a lorry (i.e., truck) driver speed up to help. He jumped from his truck cab, extinguisher in hand, ran to the car and valiantly fought the blaze. The driver and her son had fled the vehicle after it burst into flames. Amanda and I each recalled that time went into slow motion as we watched these event. We noticed many interesting details. We found the event to be quite dramatic! Next Post → Hello Sri Lanka! good craic, from the fire to the snug!